and I have teamed up with recently launched brand Candeberg to celebrate this occasion with my dear readers. 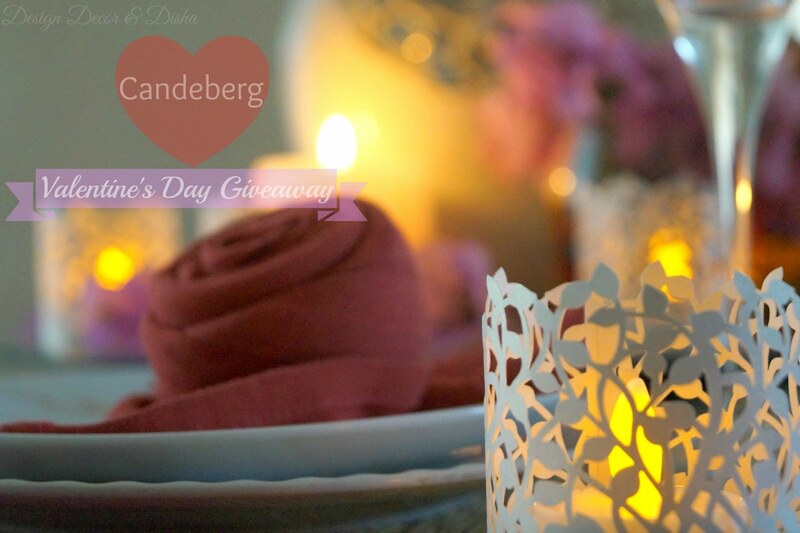 Before I share the details about the Valentine's Day giveaway let's meet our guest today, Lalitha, co- founder of Candeberg who is here to tell us more about Candeberg. We are a recently launched brand Candeberg, selling online exclusively on amazon.in. 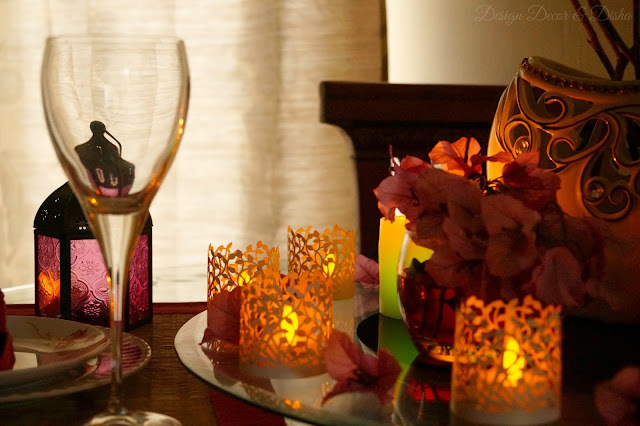 Our product is a box of 12 flameless LED tealight candles with a realistic flicker and designer wraps that make it a lovely décor piece for indoors and outdoors. It’s quite popular amongst our customers for Do-It-Yourself decorations with Mason Jars and other accessories. Our research team has meticulously picked out the best quality of LED tealight candles and tested them for durability, and aesthetic appeal. They are fuss free, flame free. Require no supervision, and can be used indoors and outdoors. 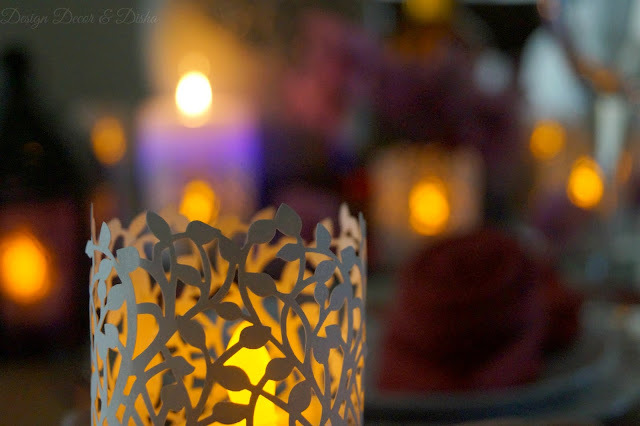 They are especially popular for wedding decor in Mason Jars, festival decor, and particularly with children for craft activities at school or home where they can make their own cutout pattern lanterns to go with these LED candles. These are benefits that cannot be matched by any other kind of Diyas or real flame candles. One of the things that I wanted to point out here is that a regular flame tealight lasts 3 hours (so a pack of 50 lasts 150 hours and costs around 250 Rs). Our tealights each last 70+ hours. So that's a total of 12 x 70 around 900 hours burn time (6 times 150 hours). So our price is for long use, durability and the added designer element of laser cut wraps, which make it a decor piece. 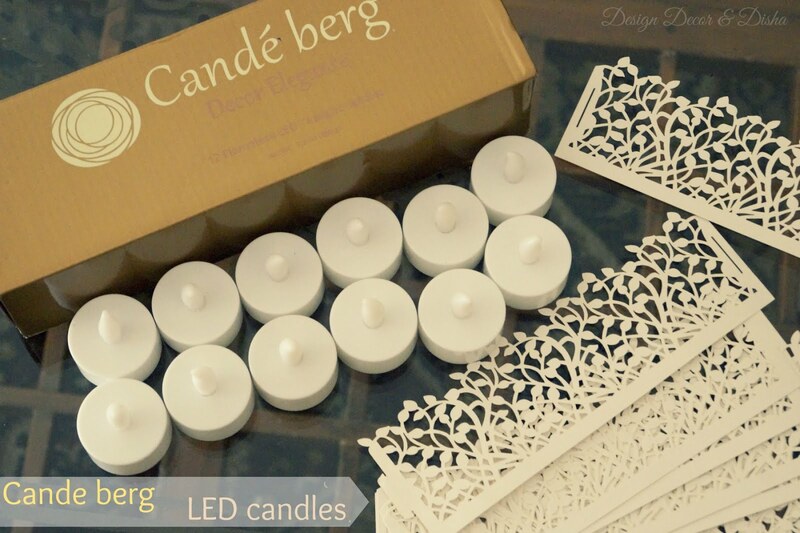 Lalitha sent me a beautiful Candeberg box that contained 12 LED tealights and 12 laser cut paper wraps to enhance the beauty of this exquisite piece. I used them in my Valentine's Day decor and I am more than happy as they are flameless hence I don't need to be worried about my hyperactive son with whom I have to be extra careful. Here is how I am using these LED tealights. Aren't they just gorgeous. 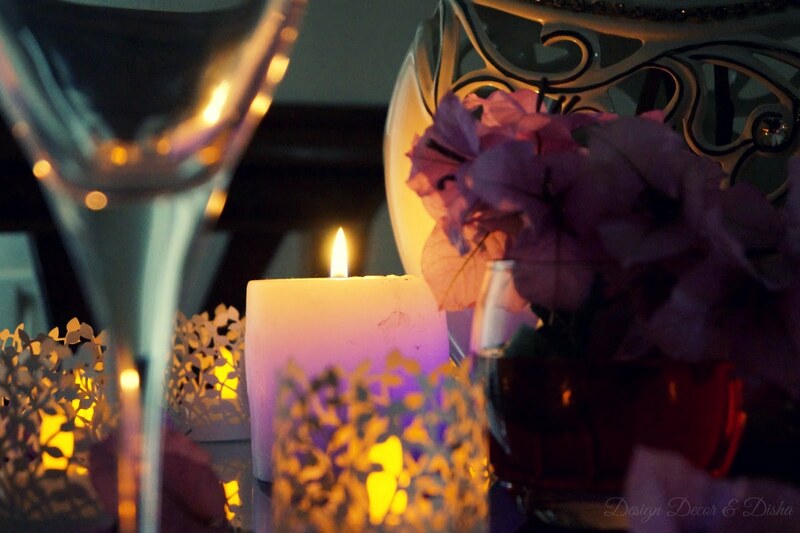 These tealights can easily create the most romantic ambience. I used them in my Valentine's Day tablescape too. Keep that flame alive in your hearts and use these flameless LED tealights in your decor! 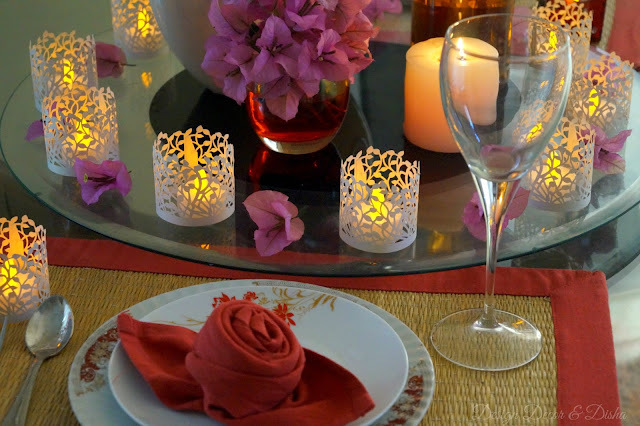 This year I decided to go with white, red and pink colour combination and Candeberg LED tealights helped me create a warm, inviting and romantic ambience. My decor mantra is to make use of what is available instead of buying things for every occasion. For Valentine's Day table decor, I used my glass tumbler as vase, filled water in it and added few drops of red food colouring and voila!! Filled this perfect for V Day vase with bougainvillaea flowers that are blooming in abundance in my balcony garden instead of buying roses. That's how my table looks during the daytime. 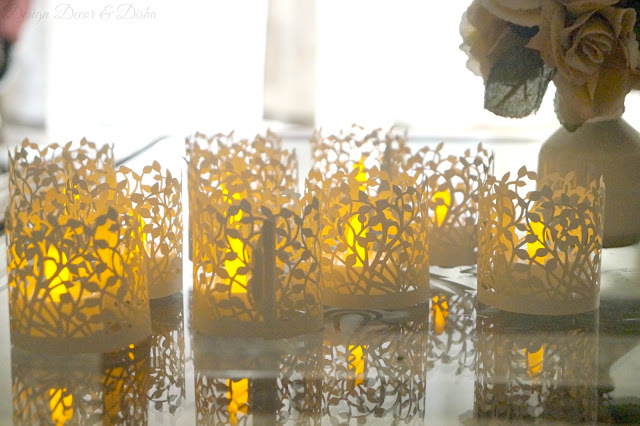 Take a closer look at this laser cut paper wraps. I especially liked how these warm yellow tealights flicker and give a realistic candle look. 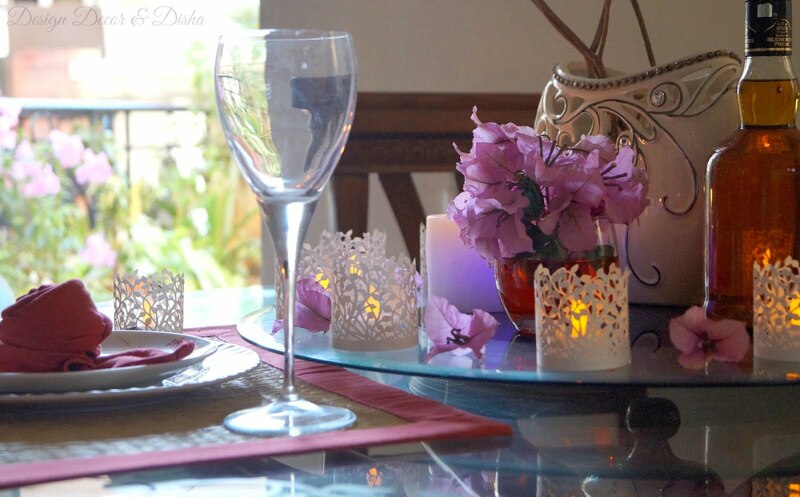 Now that you have seen how I am using these LED tealights, it's time to share the details about the giveaway so that one of my lucky reader can win these wonderful tealights totally free. 1) Share this blog post on your Facebook page and tag Design Decor & Disha and Candeberg in your post. 2) Like Candeberg Facebook page. 3) Giveaway is open till 16th February and I will announce the winner on 17th Feb.
4) Check out my Instagram Gallery and if you like what you see there don't forget to follow me there. I have something for everyone but to know more about it stay tuned. Now if you can't wait and just want to buy these exotic LED tealights right now then click the image below and gift yourself or your loved ones this beautiful box. Congratulations Shashwatee. Please share your mail id with us so that we can send you the code. So what you are waiting for. Go ahead click the link below (small image) and make your purchase enter the code HCI6Z97U at checkout on the payment page get Rs 150/- discount on listed price of Rs 1599. Code is valid till end Feb ( 29th Feb, 2016) I am sure you will definitely love Candeberg. P.S. All images are mine and subject to copyright. Please seek my permission before using them. Thank you! !